The cultural relativists on the Left and apologists for radical Islam like to blame the Crusades for almost everything. “The Muslim extremists are only responding to the deeds of Christian extremists,” the argument goes. In his new book, Sir Walter Scott’s Crusades and Other Fantasies, former Muslim Ibn Warraq takes on this misleading theme intended to blame the West for the Muslim world’s troubles. Ibn Warraq’s book tackles this misconception. Islamic atrocities were not provoked by the Crusaders’ own reprehensible acts, but preceded them. Islamic jihad was not triggered by the Crusades; it preceded them. In fact, as explained by Warraq, (and in books like The Politically Incorrect Guide to Islam and What’s So Great About Christianity), the Christian world was reduced to about one-third of what it was by the sword of jihad. The Crusades were launched with the objective of, without any exaggeration, saving Europe and Western civilization from Sharia. My personal experience in school is that the opposite was taught. The Crusaders were framed as offensive and the jihads as defensive. The Crusaders were depicted as barbarians, particularly to Jews. I cannot recall hearing about a single Islamic atrocity before or during these wars. “What are seen as positive aspects of Islamic Civilization are ecstatically praised, even exaggerated, and all the negative aspects are imputed to the arrival of the Westerners, and where the Arabs, Persians and Muslims in general are seen as passive victims,” Warraq said in an interview. One of the most interesting claims made in Waraq’s book is that the Crusades did not have a permanent impact on the Muslim psychology. Part of the reason is because the Muslim world viewed the wars as an overall victory. “Many believe that modern Muslims have inherited from their medieval ancestors memories of crusader violence and destruction. But nothing could be further from the truth. By the fourteenth century, in the Islamic world the Crusades had almost passed out of mind,” Warraq said. So what revived the relevancy of the Crusades in how the Muslim world views the West? Warraq says that the Crusades were reentered into the discourse by Europe. Imperialism was purposely framed as a continuation of the Crusades; something particularly agitating for the growing Arab nationalist movement. However, Warraq emphasizes that his point isn’t to blame the West for its use of Crusader rhetoric. The jihad existed before the Crusades and during the period when they “had almost passed out of mind” in the Muslim world. “My point is that Islamic jihad did not end with the defeat of the Crusaders. On the contrary, in Islamic doctrine all the later Islamic conquests were seen as a part of the religious duty of carrying out jihad until the entire world submits to Islam,” he said. Blaming everything on the Christians in the Crusades is a way of denying the Islamic supremacist ideology that has driven the conflict from the beginning. Were the Christians without blame in the Crusades? Of course not. Terrible atrocities were committed by both sides. But the way the story is often told today, even by many Christians, is an outrageous fallacy. Centuries of violent Islamic aggression preceded the Crusades, and it did not end with the Crusades. The use of violent force in Islam goes back to its very beginning and to its founder. No one would deny that Mohammed himself was a warrior. But everyone knows that Jesus willingly submitted to death on the cross, refusing to respond with any violence. Jesus even told Peter to put his sword away when Peter attempted to prevent his arrest; and then Jesus healed the man Peter had wounded. Luke 22:49-51 — When Jesus’ followers saw what was going to happen, they said, “Lord, should we strike with our swords?” And one of them struck the servant of the high priest, cutting off his right ear. 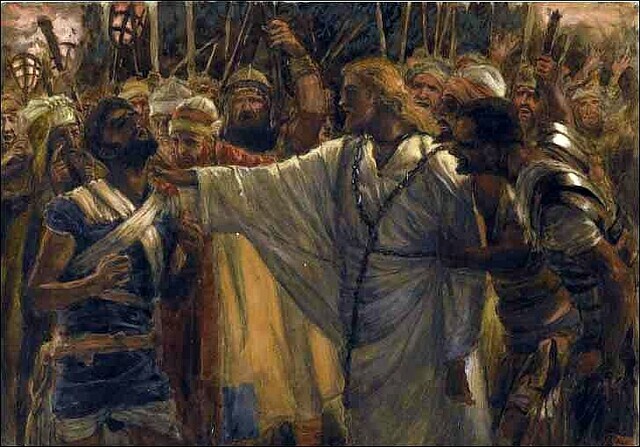 But Jesus answered, “No more of this!” And he touched the man’s ear and healed him. Matthew 5:9 — Blessed are the peacemakers, for they will be called children of God. Lord Jesus, when you came among us as a man, you bore the name Prince of Peace. Guide us in the way of peace. May peace reign in our hearts, and may we be witnesses to the peace you give to all the world. Amen. ← 627) You Have Faith in WHAT?